The nuclear mead is about 19% ABV as far as we can tell. A month or so later, it’s tasting no worse than anything made with ordinary yeast, and in a couple more should be quite guzzlable. With appropriate caution. We’ve filtered off a couple of demijohns to age at their leisure, a couple more to go. The last batch of rose mead was made using champagne yeast. This turned out a little feisty, when we bottled some and the bottle popped its cork! It had decided in this hot weather that it hadn’t quite finished. (One to watch out for.) We drank the bottle tonight and it’s amazing. Our next task will be to learn how to brew sparkling wines without inconvenient explosions … because this stuff is superlative. You so wish you could drink some. So we have this 25-litre tun, and in fact we bought a second one. Since last post, we have filtered and drunk the huge vat of Yule Mead in that post, and brewed and drunk a vat of rose mead as well (which works just as well in quantity as it does in one demijohn). For our next adventure, Arkady decided that we had the vats, so why not try it with this stuff vaguely remembered from brewing forums years ago: Alcotec 48 Hour Pure Turbo Super Yeast. To answer that most compelling of scientific questions: hey, hold my mead and watch this. Alchemist at work. Do not interrupt. RECIPE – 25 LITRES – 14% IN 48 HOURS OR 20% IN 5 DAYS. Pour 21 litres of 40°C (104F) water into your fermenter. Add 6 kgs (for 14% alcohol in 48 hours) or 8 kgs (for 20% in 5 days) of sugar and mix well until completely dissoved. Then add 1 sachet of Alcotec 48 and stir for one minute. Leave to ferment in 20-32°C (68-90F). Notice that fermentation times above may vary a little depending on your ambient air temperature. IMPORTANT: Do not use an airlock. Notice that you may have to adapt the instructions in some countries to conform with the law. The actual market is Swedes who want to make their own vodka: make the starter with this, distill the result. This would of course be wrong in the UK (and risk adverse attention from our good friends at Her Majesty’s Revenue and Customs), so we’re just making a spiced mead with it. warm water to fill it to 20 litres, measured at 39°C. Tucked under the stairs where we can keep an eye on it. It’s got enough sugar in it that the specific gravity is higher than our hydrometer can measure. We think it’s about 1.140. With a prospective Old Faithful of this potential, we decided the upstairs airing cupboard wasn’t the safest environment, so we’ve left it downstairs in the kitchen. Instead of a dinky little airlock on top, we’ve run a hose from the tun to a bucket of water for it to bubble through. Note the Blu-Tac around the hose at the tun end to ensure it’s airtight. Update: after about 24 hours, it had calmed down enough to put a dinky little airlock on. Here’s a video of its vigorous blooping. It’s still going at about this rate, another 24 hours later. After 48 hours its specific gravity is 1.062. Assuming it started at 1.140, that makes it about 11% ABV in just 48 hours. Arkady also made some prehistoric bread from it. Get a cup of the wort, add enough emmer flour to stir into a dough, knead for ten minutes, set aside for an hour to rise (doubled its volume), knead again for another five minutes, shaped into a loaf, set aside for another hour, baked at 180°C for half an hour (bake until you knock on the bottom and it sounds hollow). Unmeasured ingredients, go by feel, see what happens. The resulting bread is shockingly nice, though it has the density of depleted uranium and would be good in combat. 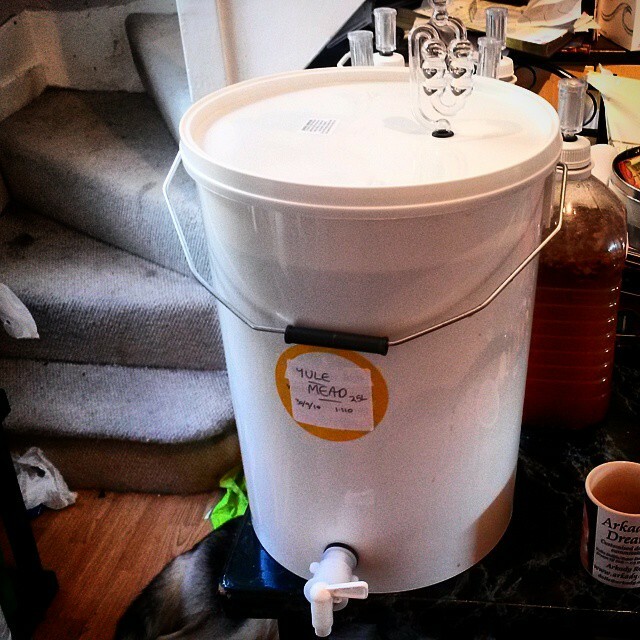 This year’s batch of mead – 25L (5 gallons). 1 tub of Young’s wine yeast (you’d probably also get good results from EC-1118 or K1-V1116; D47 probably wouldn’t work fast enough to turn out drinkable mead in under 4 months).